Dutton here meet the challenge of the belligerent hunter of musical rarities head-on. There are no compromises; no half-measures. You look in vain for a popular filler. Not that this approach is new to Dutton. They are used to the pursuit of gems among the esoteric. Here is a disc which speaks of Dutton’s musicality at its peak. It must have been an expensive project too – involving full orchestra, scores and parts to prepare, solo singers and a booklet including full sung texts and very extensive notes by Lewis Foreman. 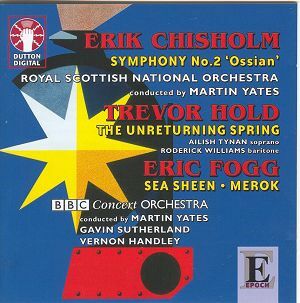 Erik Chisholm’s Second Symphony bears the name of the Celtic hero Ossian. He was also the subject of Yeats’ dramatic poem The Wanderings of Usheen – which was the begetter and accelerant for Bax’s life-long absorption into the Gaelic world. Until the recording sessions it was never performed as a symphony although it was quarried for the four-scene ballet The Earth-Shapers which was choreographed by Margaret Morris and did receive performances. Chisholm was a musical dynamo in the life of Scotland and especially in Glasgow but then, rather like W.H. Bell, moved to Cape Town where he transformed the musical life of South Africa. Something of his indomitable energy can be felt in the sturdy and tragic cortege tragic that is the first movement of the symphony. The melodic content has a Scottish skirl, snap and snarl and a twist of conflict from Vaughan Williams’ Fourth Symphony. Before the movement ends Chisholm has us breathing the air of heather and the highlands with birdsong suggesting a Caledonian Patrick Hadley. There’s even a murmurous moment or two when the slight sway of the music indicates the influence of Cyril Scott. The middle movement bears a Baxian stamp as well as the bustling impudence of Moeran and all this tricked out in gaudy Russian splendour. The finale is in three separately tracked segments. After a hymn-like introduction the music soon buzzes with activity. It transiently suffers from a touch of fugal academicism but this is quickly offset by an energy redolent of Bax's Northern Ballad No. 1. Moments of wistful beauty take us back to heather hills and stately cavalcades of cloud. The music retreats most impressively into serenity and the far horizon. There is still much to learn about Chisholm. Until reading Lewis Foreman’s note I did not for example know that Chisholm had arranged Alkan’s Symphonie (for piano) for string orchestra. As for the Second Symphony it grows in standing every time I hear it so I plead with some confidence for premiere recordings of the First Symphony, the Violin Concerto, the Second Piano Concerto entitled The Hindustani and the Pictures from Dante – the latter two revived last year by BBC Scotland. The Chisholm revival borne high by Murray McLachlan, Ronald Brautigam, Olympia and Dunelm deserves to take its place in the vanguard of the Scottish cultural renaissance. Scotland’s well-placed pride in its musical masters now needs further and sustained support for this composer. Trevor Hold was born in Northampton - the same town as Alwyn, Rubbra and Arnold. Hold however prized the town’s connection with the poet John Clare. Hold’s living was earned in the academic world. His music includes two symphonies, a piano concerto and much vocal music including two cycles for voice with orchestra. The song-cycle The Unreturning Spring is to the war poems of James Farrar. The writing here reminds me of another neglected master of song – Geoffrey Bush: his Summer Serenade is a masterwork. However more frequently Hold’s style here is redolent of Britten and of William Mathias. That enamoured and warmly misty horn in The Beloved inevitably summons up echoes of Britten’s Serenade. The horn-player delivers the groaningly ecstatic moans in the final song with total commitment and technical aplomb. The writing for the soprano is often explosive and wide-ranging. This is handled wonderfully by Ailish Tynan although the words are rather occluded by the demands of this score. This is not something that presents any problem for the reliable and honey-accented voice of Roderick Williams – a singer whose role in so many British revivals has made him a familiar presence. The two singers often enter into dialogue or commentary within each song – so the ‘division of spoils’ is more subtle and intermingled than usual. Woodwind in this work are often called on to evoke birdsong - examples abound but do sample tracks 12 and 13. The lull and gentle rocking of Eric Fogg’s mood-picture Sea-Sheen is lovingly done by Gavin Sutherland. It is a modest little piece but Fogg makes of it something very special. Time to pension off the crackly recording I have as performed by the BBC Midland Light Orchestra conducted by Gilbert Vinter. Fogg’s Merok is Norwegian in locale but rather than implying the voice of Grieg it is Delius and Grainger who come to mind. The work slips by in a beguiling haar of Delian suggestion and with lively avian flitter of woodwind song in a style touched on by Moeran. This pieces moves between warm Englishry and fjord summers. I should add that Fogg’s Bassoon Concerto – his most famous work – has been recorded and is available singly and as part of a boxed set. If you must find a link between works grouped in this way then I can provide one. The link is the doom-laden year 1939. It is the year of the Chisholm symphony, the year when Fogg died and the year when Trevor Hold was born. Three fine and contrasted works all receiving world premiere recordings. The Chisholm has Northern pomp and poetry. The Hold is a subtle Britten-style song-cycle on war themes yet with sylvan magic. The Fogg pieces are delicate and perfectly rounded miniatures.